Over 4000 people from Love Music, Hate Racism, Unite Against Fascism, Stop the War Coalition, and a number of Trade Union and Student Groups marched through London against racism. London, UK, 6/11/2010 A number of Anti-Fascist /Racist groups joined together to march through London against the continued presence of the British National Party and the English Defence League. The groups congregated at Malet Street where there was music and speeches. The march made its way through central London via Trafalgar Square, Whitehall and ended at Millbank where the road was blocked for the Love Music Hate Racism "sound stage" lorry. Further speeches were heard from George Galloway and Martin Smith. Trade Unions marched from the RMT headquarters near Euston to rally in Bedford Square against the cuts in Public spending London, UK, 23/10/2010 Several thousand people gathered outside of the RMT headquarters to march and rally against th proposed cuts in public spending announced by the Government this week. The march was joined by a group from the Fire Brigade Union who were on strike during 23rd October . There was a number of speeches at the rally from people including Bob Crow, Jeremy Corbyn, and Matt Wrack The speeches were calling for a major demonstration to take place well before the announced March 2011 date, and also for a General strike as well as encouraging students to occupy their colleges. The Saturday following the death of Margaret Thatcher was always planned as being a "Party" in Trafalgar Square. Apart from a dignified involvement by the NUM the rest of the occasion was largely a drunken gathering. Over 100,000 people marched through London against the UK Government's austerity measures. 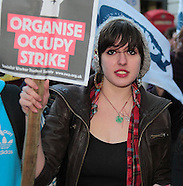 Several thousand Students and Trade Unions marched through the centre of London to demonstrate against the Government spending cuts announced today London, UK. 20/10/2010 Students from the University of London marched to Lincoln's Fields and met up with a variety of Trade Union groups to form a collective demonstration against the Government cuts in public expenditure. The march ended up outside Downing Street where a number of speeches were made by a number of Trade Union leaders, MP's, and other interested parties including Bob Crow, Jesse Jackson, Jeremy Corbyn and Lindsay German. There were a few scuffles as the march arrived outside of Downing Street due to a misdirection given by the Police. This resulted in some unnecessary violence which quickly dissipated. By the time the speeches had finished, and there were many, most of the crowd had left leaving almost as many police as protestors; the police waited patiently outside Downing Street to ensure that no late, opportunistic, excursions near no.10 took place. 500 people from a variety of environmental groups came together to take direct action on Coryton Oil refinery to stop the distribution of oil for the day. Stanford-le-Hope, UK, 16/10/10 3 Blocs formed up in central London meeting at Victoria, Euston and Waterloo stations representing the themes of Dirty Money, Building and Body. Each of the Blocs made there way via different routes through to the Coryton Oil refinery near Stanford-le-Hope. This refinery supplies 10 million tonnes of oil to all the major petrol and oil outlets in the UK. A heavy Police prescence on the journey resulted in a "stop and search" of a number of protestors and a few being cautioned for carrying large blocks of chalk. The Police escorted the groups to the refinery area from the station through the local countryside. An earlier contingent managed to block the main road from the refinery with a couple of vans, and this prevented a number of tankers from leaving the site. The blocs set up a number of tripods which were the primary line of defence. There was a generally convivial, and carnival atmosphere. There were a few minor scuffles with the Police but this settled down and the Police continued with a hands-off approach for the whole day. The group achieved their objectives for the day by stopping the distribution of oil from this refinery - whether it will capture the imagination of the general public and contribute towards changing behaviours is another matter..
A march of over 5000 people took place in Derby against a decision by the Government to source the Thameslink trains to Siemens. This will result in the loss of 1400 jobs at Bombardier. Derby, UK, 23rd July 2011.